It’s not easy eating green. 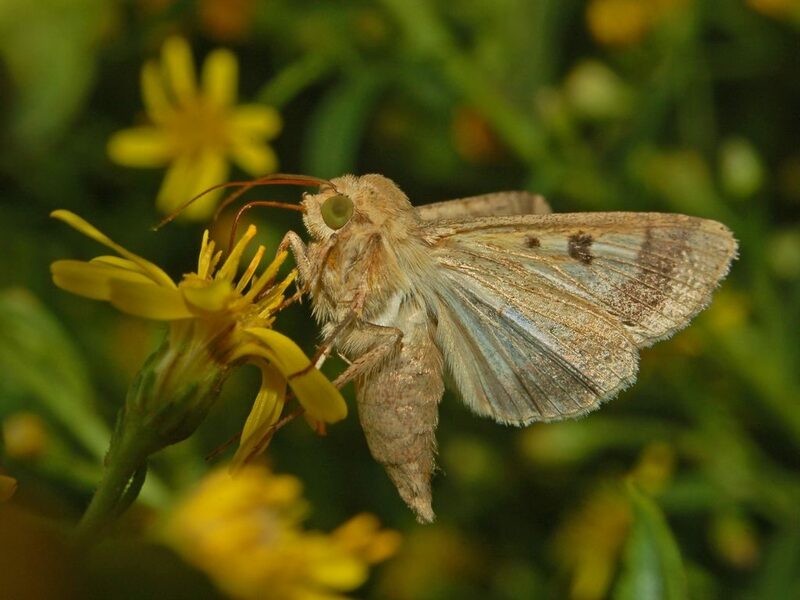 The cotton bollworm is remarkably adaptable, overcoming most insecticides and devouring crop staples—so with its compound-eyes set on the hitherto unexplored New World, home of the closely related corn earworm, it was a race against time for researchers to map its genome and find the genetic flaws to put a halt on its calamitous appetite. Unless you’re an unscrupulous worker on the production line for pre-made sandwiches, there’s no such thing as a free lunch. And this is doubly true for the rest of the animal kingdom. Meat-eating animals face the very real threat of being killed by their lunch, which is more than clear if you’ve seen the violent death throes of a water buffalo. What’s not so obvious are the dangers faced by plant-eating animals. Death-by-plants is not through goring, but poisoning, poisoning with chemical weapons that are lethal and just plain unnerving, like cyanide (thanks, almonds), the nightmarish cocktail from Brugmansia, the angel’s trumpet, which induces spasms, paralysis, tachycardia, and cardiac arrest, and of course cyclopamine from the corn lily, the eating of which may or may not turn you into a cyclops. To deal with such a defiant lunch, plant-eating animals have two strategies: generalise and eat tiny amounts of lots of plants—a mildly toxic smörgåsbord; or specialise and commit so lovingly to a single poisonous food source that, mutating over evolutionary time, your descendants will finally have the biochemical ‘gear’ to survive on that food source—think of the enduring marriage between koalas and the toxic Eucalyptus. Koalas’ ‘resistance’ to Eucalyptus toxins is uniquely theirs (and the bacteria that facilitate it), the legacy of a long-chain of sick and ill-equipped koala forebears. It takes time, serious evolutionary time, to evolve the mutations for breaking down these nasty toxins; these genes are precious. Just imagine the fate of Eucalyptus if these koala genes got into the genomes of the country’s moths, possums, bugs…humans. Well, start the war drums because there’s a cloud on the horizon, a stem-shearing, toxin-diffusing, cast-iron stomached, generalist eating machine of a cloud: Helicoverpa armigera, the cotton bollworm. Helicoverpa armigera rearing its six legs back over its sticky pseudo-feet. You know pyrethrins—the insecticidal plant toxins that destroy insect brains so thoroughly their mere presence repels insects? The cotton bollworm eats them for breakfast. But it doesn’t just eat those for breakfast, it also eats tobacco, cotton, rice, flax, and chickpea—and their toxins, too. 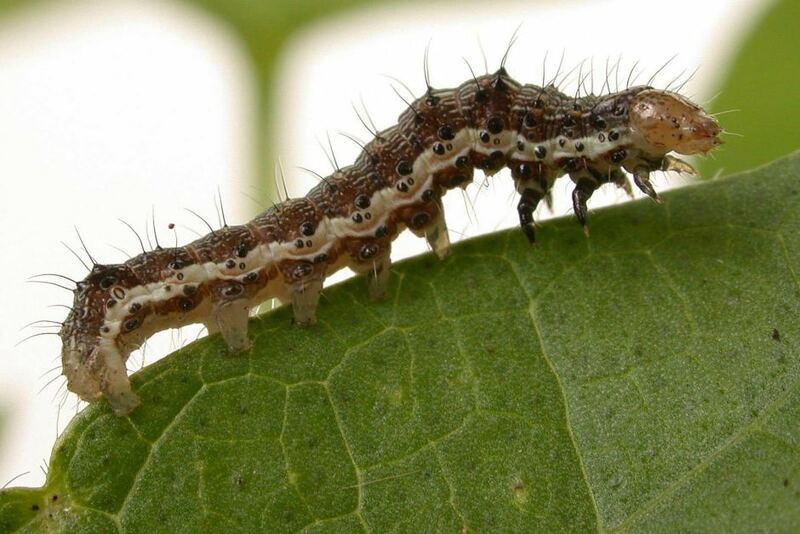 In fact, the cotton bollworm has been found eating over 300 plant species not to mention any siblings in the area (yes they’re cannibals, too): just imagine the 300 pages of Eric Carle’s gaudy epic. Helicoverpa armigera has evolved genetic defences not just for pyrethrins, but “resistance of Helicoverpa armigera has been documented to almost all kinds of insecticides”. Very much the Rasputin of the moth world, H. armigera has evolved so many chemical defences you might appreciate its species name, H. ‘armigera’ — the armoured one. Just imagine the forest-stripping damage that might be wrought if koalas acquired these genetic chemical defences. 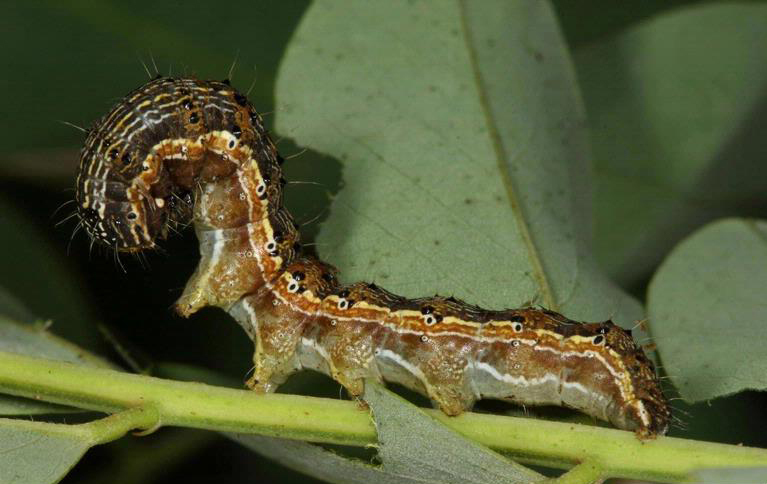 It’s thought the cotton bollworm hails from Africa, but it scarcely matters since it has now dominated the planet to become one of the world’s worst agricultural pests. Each year it eats through $6 billion USD worth of crops and has wreaked enormous havoc on our own Australian crops, including cotton. It might be no surprise that our researchers have been fighting against the digestive tides of H. armigera for some time. During the 90s a bacteria-derived toxin was introduced to cotton—creating Bt cotton, which saw a mighty drop-off in H. armigera, leading to 80 per cent less pesticide use. And while we and the cotton industry in Australia have maintained Bt cotton to control the species, resistant H. armigera have evolved over seas and remain an ongoing threat. With H. armigera adapting and bending around each new attempt at chemical biocontrol, like Bruce Lee playing dodgeball, it was time for researchers to look under the hood at the genome of this incredibly flexible creature to find out its secrets, the key to its heart through its stomach. Thus began an eight year project to sequence H. armigera’s entire genome. While the cotton bollworm has colonised and eaten its way through Africa, Europe, Asia, Australia, and Oceania, there were two remaining continents yet to feel the spiny then suction-y legs of this hungry, hungry caterpillar: South America and North America, the homeland of corn, tomatoes, avocados, and, heaven forbid, chocolate. 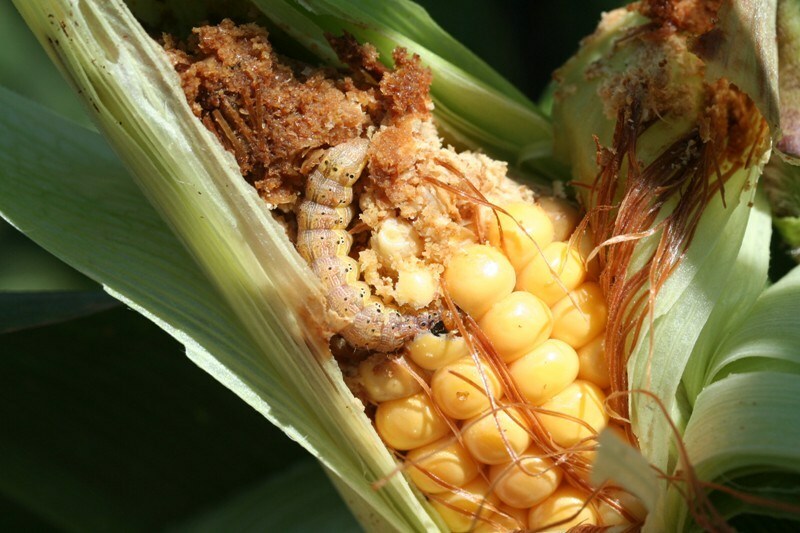 The corn earworm (Helicoverpa zea) appropriately eating some corn. Enjoy your own cheap joke: Corn can’t help listen out for biocontrol solutions for H. zea because ___ ____ ______. 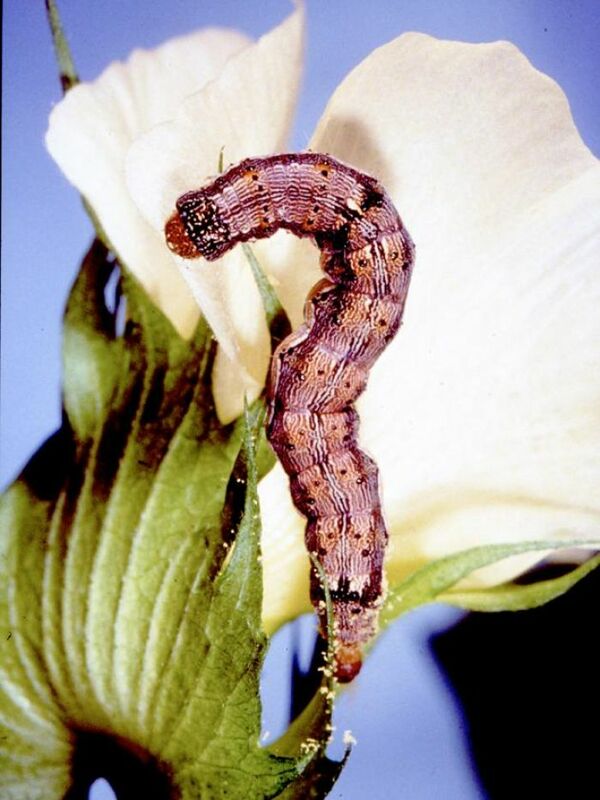 As it happens, a species of Helicoverpa caterpillar—the corn earworm (H. zea)—had already made it to the Americas, but was less of a problem than H. armigera. Firstly, the corn earworm was unable to eat the same destructive range of plants as H. armigera (possessing instead a more sophisticated palate for asparagus and artichoke), but more importantly, H. zea lacked the genetic flexibility and resistance to many pesticides, meaning it could still be controlled by chemicals and Bt crops. You might imagine then the sirens and alarm bells of scientists and farmers alike when, sometime around 2013, the mighty cotton bollworm, H. armigera—genetic chameleon, world champion toxin-digester, and all-round home-wrecker—showed up in Brazil with H. zea among the corn rows and tomato plantations. You might also imagine the sirens when researchers saw what might happen next: two closely related caterpillars, two epic appetites, two startling sets of genetic defences against all of humanity’s pesticides, and now some quiet time alone, together, with the kids staying at their grandparents. The decimation of global food stocks aside, Helicoverpa armigera is a bit of a cutie. July 2017: the results of the genome study were published, successfully mapping the genomes of not just H. armigera, but of H. zea, too. The results showed that both H. armigera and H. zea have a long history of detoxification—over 100 more detoxification genes than other caterpillars, and that both groups might well hybridise forming an organism not just resistant but also locally adapted to North and South America. April 2018: our researchers, along with one of our alumnus, now at the University of Edinburgh, published findings from their work in Brazil at the hybridisation zone—where both species of caterpillar meet and overlap—detailing the individuals there that possess hybrid genomes, the majority of their DNA from H. armigera with genes of H. zea scattered throughout. The mega-pest is born. More than this, there isn’t one mega-pest. The hybrid individuals aren’t the same. Different caterpillars have different proportions and combinations of genes from both parent species, a collection of individuals known as a ‘hybrid swarm’. And though limited to South America (and parts of Central America) for the moment, an inter-connected, globalised world of trade and travel means this mega-pest is, unfortunately, a latent global mega-pest. 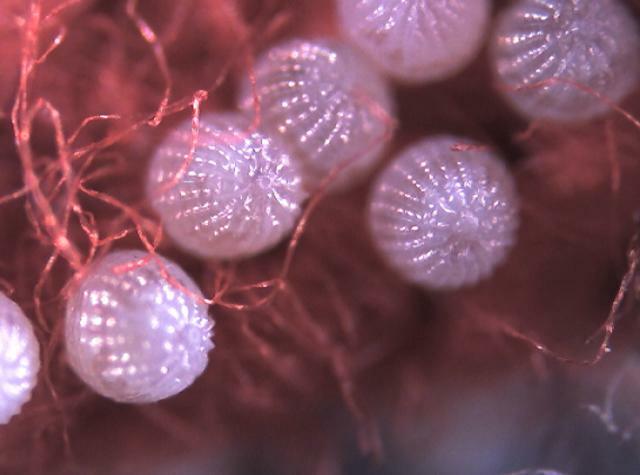 A tangle of bauble-like Helicoverpa eggs. “On top of the impact already felt in South America, recent estimates [have] 65 per cent of the USA’s agricultural output is at risk of being affected by H. armigera,” says Dr Craig Anderson, lead author of the hybrid findings. Okay, so we’ve got very hungry, very resistant, very mobile mega-pests perched in the Americas, prepared to take flight as “humanity’s greatest competitors for food and fibre,” according to researcher John Oakeshott. Things look dire. In fact, things might look dire enough to make ‘Biosecurity’ seem like a pretty pressing field right now. Fortunately, thanks to foresight and eight years of ground-breaking genetic research, we know a little thing or two about Helicoverpa. Actually, not just a thing or two. We know a lot about Helicoverpa, inside and out, which puts us in a uniquely powerful position. Though these hybrids pose a looming problem for the Americas, they’re not an immediate threat to our own crops here in Australia. And even with the risk of global trade importing hybrid H. zea and H. armigera mega-pests, we’re better equipped than ever, our genetic tools making us the veritable ‘armoured ones’. Hungry for more science behind Bt cotton and the war against Helicoverpa? Ear worm, boll worm, army worm… by any name they’re nightmare pests of so many crops, and hybridizing too. Aieee. Watch this space and forget the Commonwealth Games: CSIRO is into a far more important competition. Lobby your federal politicians for funds where they matter. Without a well resourced customs operations, Aboriginal and Torres Strait Islander Ranger programs and national park rangers – we risk so much.